“I spend much of my free time taking photos and learning about photography. 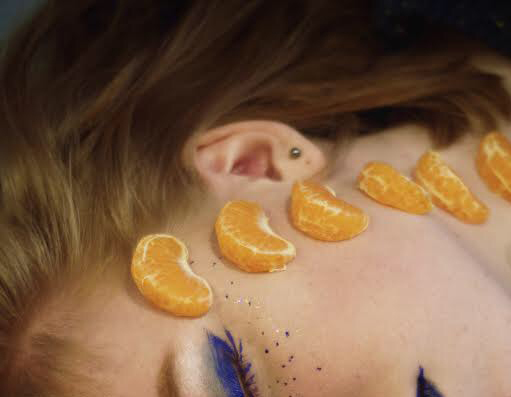 I shoot both film and digital and many of my best shots are of my best friend who so graciously let me put orange slices on her for this piece. “I’m immediately drawn into this piece by noticing these highly saturated, complementary colors popping out at me, a very strong artistic direction in the subject’s makeup, while also really getting drawn in because of how tight the frame is around the subject. Your use of diagonals is also really activating the space and helping us move our eye around the photograph. One area I’d like to see push more is perhaps the content behind the piece. 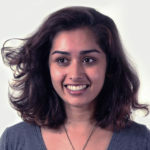 I do like how you mentioned in your statement your deliberate use of this specific person because of her vibrant hair. However, I’m wondering kind of what statement you’re making as an artist through this piece. 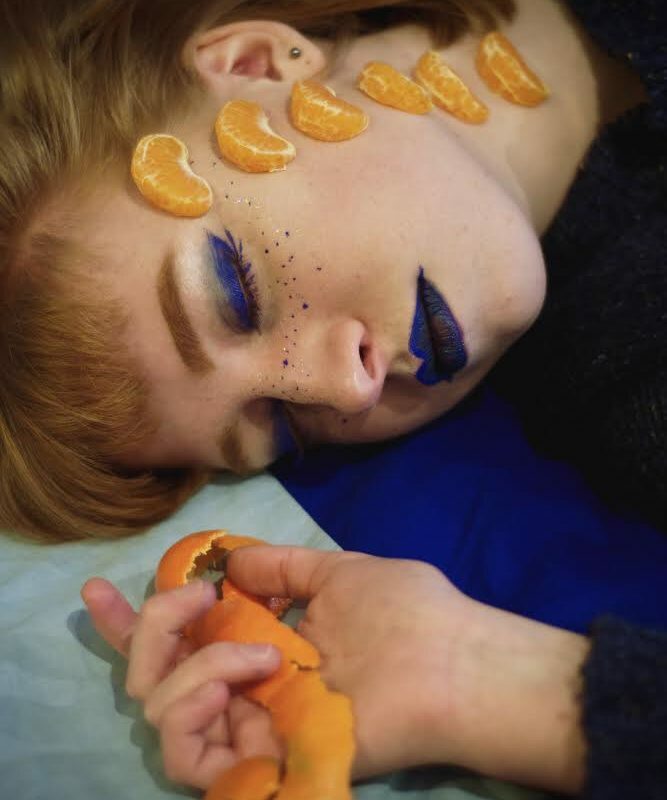 What narrative purpose does the the orange fruit serve and how does that narrative change if the orange was still intact? Why are all the pieces of this orange in a single file line all facing the same way? Who is the person in the image and why do we care about her? 3 responses on "Oliver Ward"
It’s so interesting to read that you prefer street photography, as there’s so much to appreciate in your staging of this image! The strong diagonals of the blanket and the figure’s shoulder and arm keep our eye moving throughout, and the peculiar placement of the orange pieces is really engaging. For me, however, the makeup (around the eyes, especially) compete for attention with the other elements, which I find much more interesting. 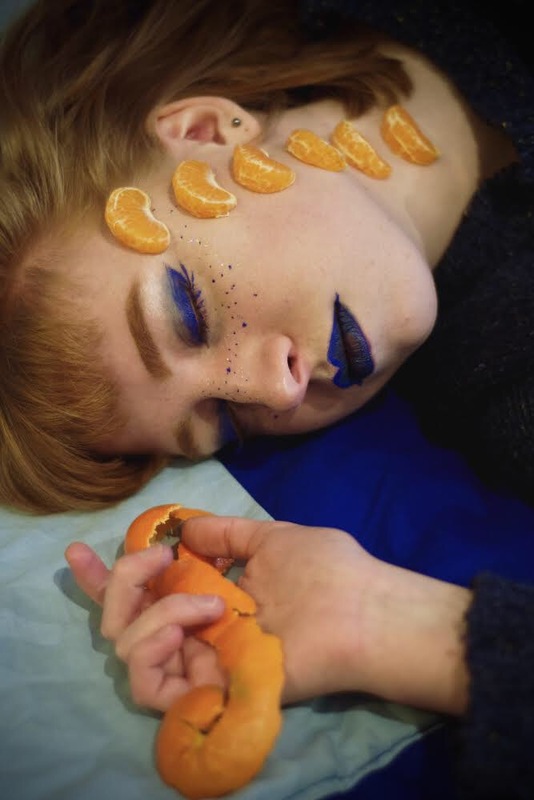 This kind of stylized makeup can be a really compelling subject (in the photography of Claude Cahun, for example) but here it seems counter to your original inspiration – to rhyme the color of your friend’s hair with the orange. The blue background and lipstick are enough to create an engaging color palette, and I’m personally more excited by the curl of the orange slice, and the way this shape is mirrored also in the hair of your subject. I would love to see you draw more anachronistic comparisons in further work. You have excellent instincts as a photographer! The colors are really striking in this piece, right away they’re what I notice immediately. The way the orange slices are so carefully arranged on the figure’s face really pique my curiosity, they’re in direct contrast with the figure’s pose which seems very natural and spontaneous. For this reason, I think I would love to see you quadruple the number of orange peels and slices! 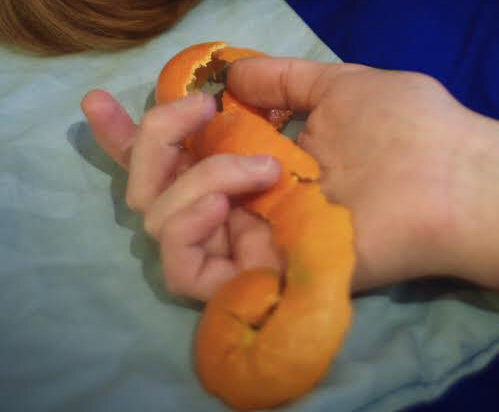 Right now the figure is the dominant part of the images, and the orange slices/peels seems more like an accessory. Between the orange slices and the figure, the orange slices seem like they have a lot of narrative potential simply because that’s not something you see every day. You might want to look at the Dutch Vanitas still life paintings for inspiration, a very common motif they used was peeling fruit, as a symbol of mortality. This piece is magical. The color palette and composition are spot on. I think my favorite parts are the small details like the makeup freckling that looks like stars and the simple metal ball earring. I don’t remember the artist’s name, but there was an artist that did an installation where she/he covered an entire road with orange peels. If you want to continue with citruses, that might be something you’re interested in. I’m kind of wondering what the orange could mean metaphorically/symbolically? How are citrus used in mythology or religion? How could this factor into your photograph? I do think the image is gorgeous, and I could see this as an amazing painting. Well done, Oliver!